The value of religious community archives is much more than preservation of the history of a particular religious community. They are also an important resource for mission and heritage formation in health care, education and social-service ministries that are, in large part, led today by laity. 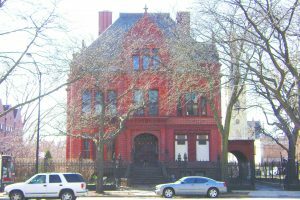 Such is the case with the Sisters of Providence and Providence Health & Services (PHS), which was born of the Sisters’ early work in the American West. Stained glass mural, incorporating images from Providence Archives collections, reflects the heritage of the Sisters of Providence in the West. Dedicated in 2014, the mural is prominently displayed in the main entrance of Providence St. Joseph Health system office in Renton, Wash. It replicates one in the International Center of the Sisters of Providence in Montreal. Sisters’ charism and spirit. In earlier years, these values were absorbed simply through the experience of the Sisters’ personal actions and service in multiple roles. In the late 1970s, as Sisters filled fewer roles and became less visible in PHS ministries, mission effectiveness programs were developed in response to a movement for hospital staff to relate mission to all facets of their daily work. Mission statements and core values became part of the work culture. Today, these programs have developed into full- fledged, system-wide mission and heritage formation programs ranging from a daylong orientation to annual weeklong celebrations and several-month and multi-year programs. The foundation of each of these programs is the history preserved and made accessible by the archives. ministry. Providence Health & Services is now part of Providence St. Joseph Health, created by PHS and St. Joseph Health. 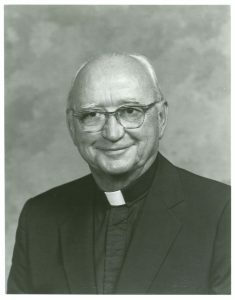 It includes the heritage of the Sisters of Providence and two other religious communities, Little Company of Mary and Sisters of St. Joseph of Orange, as well as six other affiliated health systems. 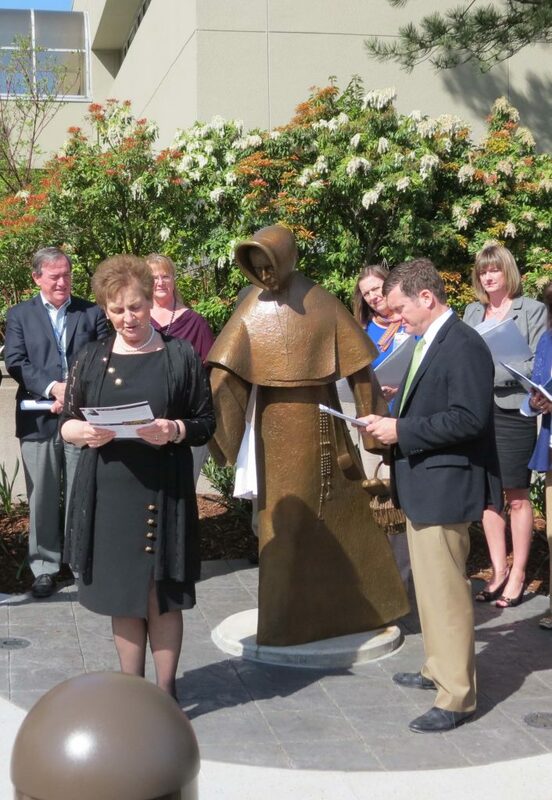 Sister Susanne Hartung, SP, Chief Mission Integration Officer, and Mike Butler, CEO Providence Health & Services, participate in a mini-pilgrimage at a statue of Blessed Emilie Gamelin, foundress of the Sisters of Providence in Montreal. The statue stands outside the health system office in Renton, Wash., and at several other Providence ministries in the west. 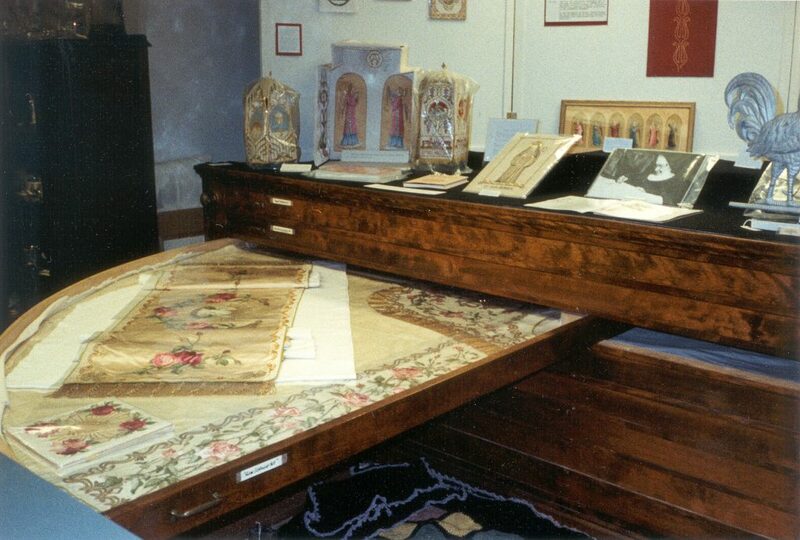 The Art/Needlework Department of Saint Benedict’s Monastery had its roots in St. Walburg Convent, Eichstatt, Bavaria, its motherhouse. Sister Willibalda Scherbauer, one of the first Benedictine sisters from Eichstatt to arrive in Minnesota in 1857, was trained in needlework as a young girl. 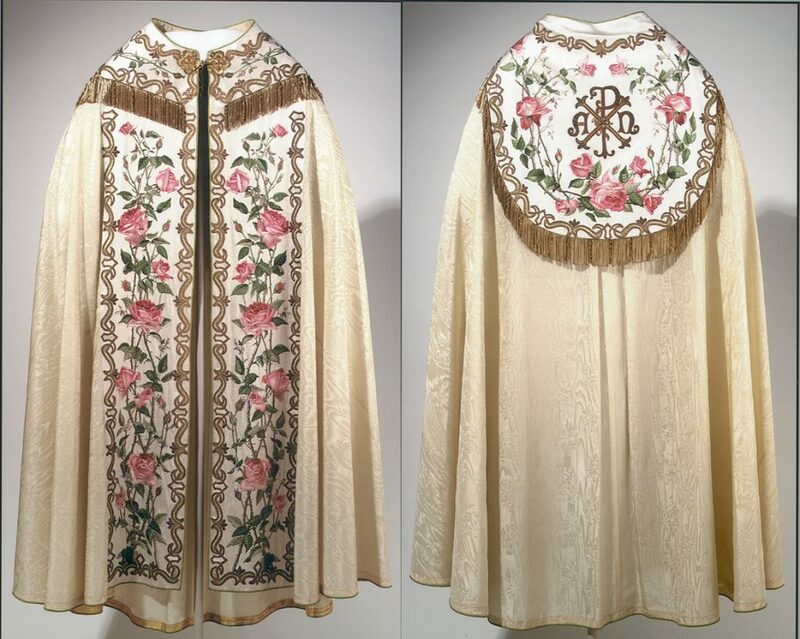 She taught the first class in art needlework, specializing in fine embroidery, training many of her fellow nuns. 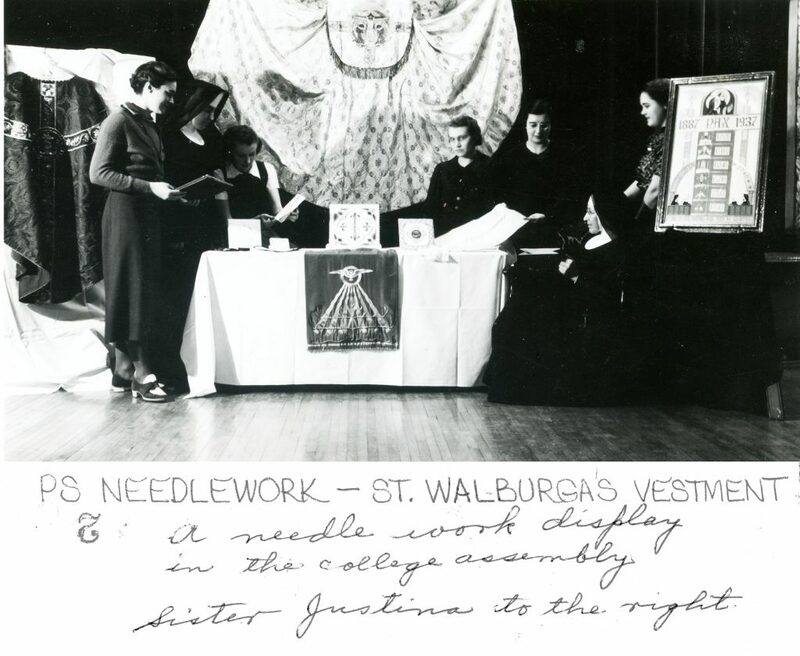 The department was housed in a small attic room for many years, but with the great growth of Catholic churches and parishes in central Minnesota, the demand for the sisters’ needlework increased so much that more space was needed. 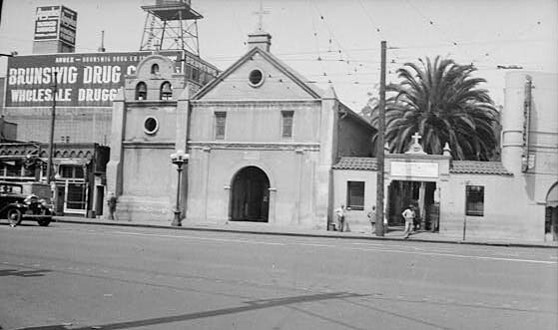 In 1923 a new building was erected— St. Walburga’s Hall— which housed the department for the next 45 years. Over 45 sisters served in the needlework department between 1890 and 1968, many of them for 10-25+ years. 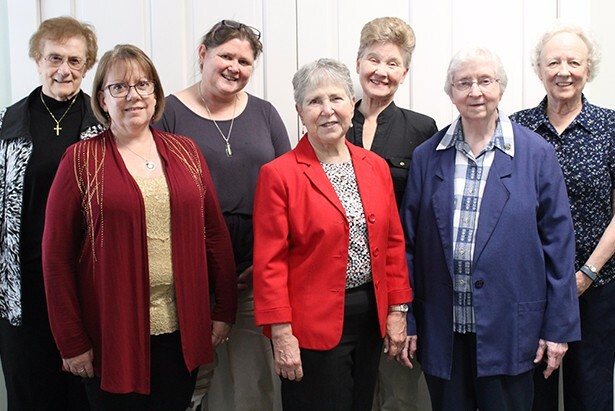 These sisters’ skills were handed down through a century, and one devotee in particular, Sister Arsenia Knaus, taught them to the College of St. Benedict students over a forty-year period—mainly in the years 1939-1960. 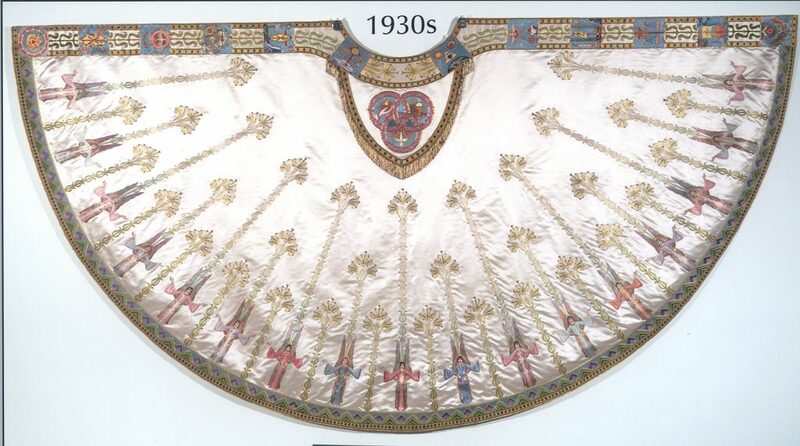 Her classes in needlework were often oversubscribed, the most popular course focusing on Hardanger, a form of embroidery. Her students took pride in beautifully embroidered table mats, guest towels, pillow slips and vanity sets. To meet the demand for more instruction, S. Arsenia would sometimes conduct a supplemental class one evening a week. 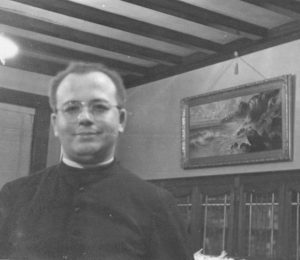 S. Arsenia died in 1966 and the monastery needlework department closed in 1968, no longer able or needed to supply church goods. Leaders of religious congregations play a pivotal role in preserving a congregation’s archives. 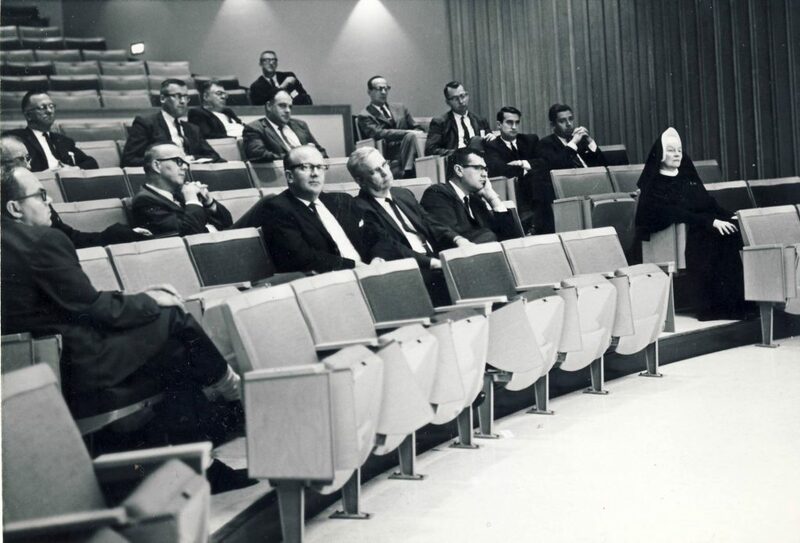 When I began my role as the congregational leadership liaison to our archives, I knew very little about the subject. However, as my understanding of archives grew, it is clear to me now that leadership has a proactive responsibility for maintaining and developing their congregation’s archives. I believe that there are three areas of responsibility. First leadership must ensure that their archivist is competent and passionate about preserving and enhancing the congregation’s collection. Second, leaders must provide an adequate budget for archivists. The budget needs to provide more than personnel, space and supplies. Funds for ongoing education and networking with other archivists from religious communities is essential because this field constantly changes. And last, leadership is responsible for ensuring that their archives are open to researchers. The story of religious life is too rich to keep for ourselves. In his recent Apostolic Exhortation, Gaudete Et Exsultate, Pope Francis offers an important vision about spirituality that I think also applies to our view of a congregation’s archives. Archives are not about our “life as a museum of memories.” Properly used and understood, archives enable us to “to contemplate (our) history in light of the risen Jesus.” Our collections tell the amazing story of how the mission of Jesus is made real in our time and place. For American religious women, the archives tell the story of how women in the 19th , 20th and 21st centuries were and continue to be leaders and visionaries. Impelled by God’s Spirit, sisters pioneered leadership roles of women. They helped to shape the American Catholic Church. As leaders, we have both a responsibility and a privilege to ensure that our archives are preserved and developed as the public face of our history. Archives tell the remarkable story of God’s spirit working through the lives, the prayers, and the ministries of our sisters. March 10, 1965 march in Selma, Alabama. Pictured from left to right Sr. Roberta Schmidt, CSJ, Sr. Antona Ebo, FSM, Sr. Rosemary Flanigan, CSJ, and Sr. Eugene Marie Smith, FSM. Associated Press (AP) photo. As a historian, I think it is important to remember and emphasize that the lived experience of American sisters is embedded within broader social and cultural struggles that rocked the nation in the last half century. 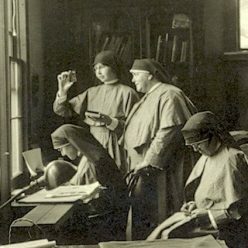 By the mid-1960s, over 200,000 Catholic women were living and working in over 400 religious orders in the United States providing an invisible, and often taken for granted, workforce that had created and or staffed thousands of schools, hundreds of hospitals and social service agencies across the country. The iconic AP photograph above – front page headlines in most major newspapers – documented a watershed moment in the history of women religious and the history of the United States. 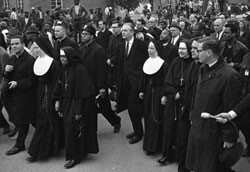 Although the six Catholic sisters who marched in Selma that day were among hundreds of marchers, their presence was a landmark occurrence, an event that would reverberate around the country. Never before had Catholic sisters been involved in a national public protest, let alone one that was covered by all the national media. By the final march to Montgomery completed later that month, approximately 50 sisters representing 12 religious orders had gone to Selma. Catholic nuns would never be found on the sidelines of social activism again – they moved center stage. The mandates of Vatican II dovetailed with the major social upheavals and transitions prevalent in 1960s America. The Vietnam War, the War on Poverty, the Civil Rights Movement, and the Women’s Movement jerked the country out of its 1950s idyllic complacency and shook the nation into reexamining its own ideals and its bedrock principles of equality and justice for all. Women religious were far from immune from these social struggles and emboldened by the mandates and optimism of Vatican II, they saw these events through the lens of Gospel imperatives and as significant opportunities to live their Catholic faith and religious identity in the modern world. Armed with graduate education, real-world experience, and the spirit and documents of the Second Vatican Council, many American nuns began an even greater transition into the public sphere expanding social justice ministries beyond institutional borders. They worked on issues of discrimination involving race, gender, ethnicity, immigration, disability, and gay rights. They moved into the inner city and the hinterlands building housing projects and providing healthcare and education to the urban and rural poor. Prison ministry, anti-death penalty advocacy, environmental and peace activism became part of their social justice agenda. And globally, they reached out to women and children through microfinancing, fair trade advocacy, water and land management issues, and anti-violence campaigns. 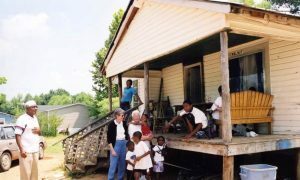 Sr. Martha Smith, CSJ and Sr. Dolores Fitzgerald visit a family in Vredenburgh, Alabama, 2004. 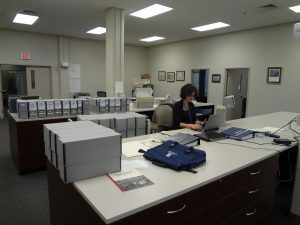 Carol Coburn papers, Martha Smith Archives and Research Center. Joining with other secular agencies outside the Catholic Church to advocate for justice, Catholic sisters provided advocacy and in some cases leadership for the development of Head Start, the War on Poverty, the United Farm Workers, the Sanctuary Movement supporting Central American refugees, as well as protests to close the School of the Americas at Ft. Benning, Georgia. Attempting to take more active responsibility for the investment practices of national and global corporations, sisters also participated in protests and asserted power as stockholders against discriminatory policies involving issues such as worker’s rights, nuclear weapons, housing for the poor, and many issues involving multinational peoples. These contributions to social justice cannot be overestimated and provide a significant narrative in American social history, women’s history, and Catholic history in the 20th century. 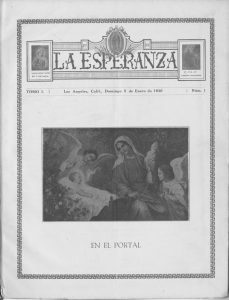 Catholic archives must insure that this story is preserved, accessible, and communicated globally in a world searching for meaning and survival in the 21 st century. On April 26, 1858, the German Franciscans of the Holy Cross Province found a new home on the shores of American soil. Exiles from their fatherland, they established an independent province on July 2, 1879. The new province was named after the Most Sacred Heart of Jesus. 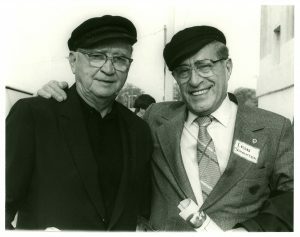 Their mission was simple – to bring the Gospel to the German-speaking Catholics. First, parishes were established in Illinois and then to Missouri, Indiana, Nebraska and Ohio. 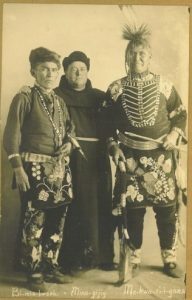 Their deep devotion stretched further to the Native Americans in Michigan, Wisconsin and Minnesota and Athabaskans living in Alaska. As the missions opened up, the Friars began to serve the souls in far off lands. They were entrusted with their own missions in countries such as; China, Brazil, Africa, South Sudan; while sending missionaries to Morocco, Philippines, Russia, Singapore, South Korea, Hong Kong, Japan and Vietnam. 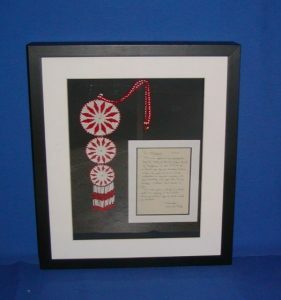 This medallion, received in 2009, is preserved in the Provincial Archives and stands as a testament of the friendship and respect between two chiefs – one of the St. Croix Band of Chippewa and the other of Father Michael Perry, the Minister Provincial at the time of the Sacred Heart Province. Extraordinary keepsakes stand as a physical reminder to the long history and spiritual ministry imparted by the Franciscans priests and brothers to all of God’s people. Today, the Franciscans continue to care for the needs of parishes in nine states. They support one another in fraternal communion. They proclaim the Gospel in respect to the diverse cultures for which they labor. And, it is within the walls of the Provincial Archives, where the documents come alive once more to reveal the Franciscan devotion for God’s people as it has shaped our history’s past. The role of archives within an institution is a reflection of the organization’s values. Unlike the world of secular archives, Catholic religious’ archives have a mandate, that of Canon law, stipulating “all documents concerning the diocese or parishes must be kept with the greatest care” (Canon Law, cc 486). However, how each Catholic entity interprets and executes such directives varies greatly. . While religious community members can agree that archiving records of historic value is important to the legacy of the community, it becomes less clear where the necessary resources will come from to create and maintain such an endeavor. And the looming question remains…what becomes of the archives upon the closing or transitioning of the community? However, the Sisters of Mercy are facing issues similar to the rest of religious communities, including, limited resources, and a future in transition. How do we Archivists advocate the allocation of such finite resources to our work, given those circumstances? 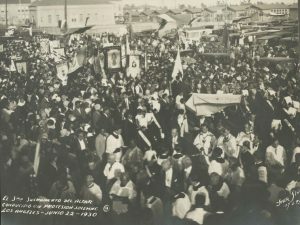 Currently, advocacy for the SOM archivists means not only educating key audiences on what archives is and how it functions, but how it is important to an organization beyond the “history”. To be relevant, we try to take advantage of every opportunity to educate the Community members, leadership, and staff on what it is we do and how it can serve the Institute. Beyond building credibility, we want them to understand that being an archivist requires specific education, training, and experience – a certain skillset and personality. One could argue it is a calling – a passion to preserve and relate the history of an institution. 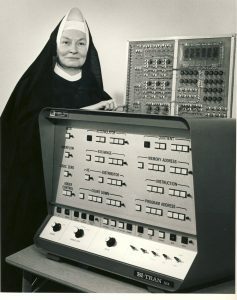 As the Sisters of Mercy evolve as a Community, so too, we hope the Mercy Archives can evolve to reflect the new reality. As religious orders are faced with limited incoming membership and resources, where do Archives fit into that scenario? The upcoming working conference, “Envisioning the Future of Catholic Religious Archives” will attempt to have dialog around these issues and explore potential solutions, through the leaders, archivists, and historians of religious communities.